3:45: How did perkz at AD carry happen? 12:40: What do you think will make a successful LEC? 29:02: What's the next step for the Counter-Strike team? 32:55: Why commit so hard to French CS? 38:05: What are the effects of having an inconsistent team on your brand? 42:35: How do you feel about your decision to get into R6? 45:30: Do you think there's an esports market correction coming? 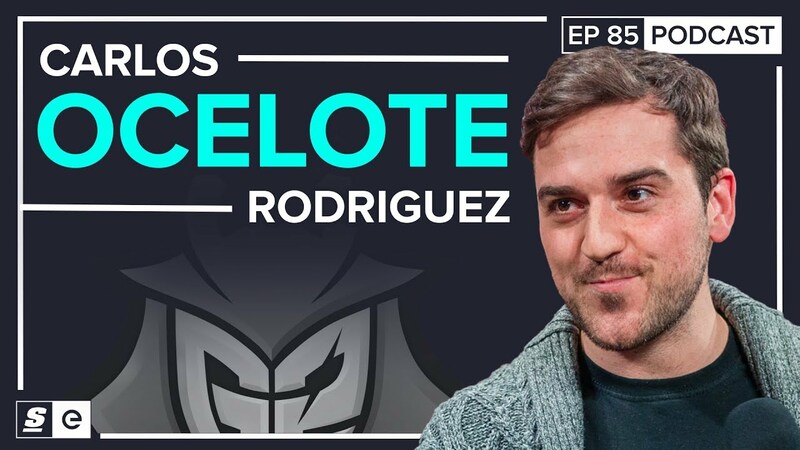 Carlos "ocelote" Rodriguez is perhaps the most outspoken owner in esports. His team, G2 Esports, has, over the past few years, become one of the biggest in the industry, with successful teams in several major games. But 2018 brought some surprises for the org. Their League of Legends team made a shocking roster move, while their French CS:GO squad had an uncharacteristically inconsistent year. Ocelote sat down with theScore esports Podcast to discuss those two teams, along with the future of the esports market and the growth of Rainbow Six Siege. Find theScore esports podcast on iTunes. G2 signing Fnatic's former mid-laner, Rasmus "Caps" Winther, was perhaps the most surprising move of the LoL offseason, particularly because it meant G2's own star mid-laner Luka "Perkz" Perkovic was making the move to the bot lane as the team's new AD carry. But ocelote says it wasn't some sort of knee-jerk decision, and Perkz had been considering playing ADC for quite some time. "We always toyed with the idea," he told theScore esports. "I had a podcast with Perkz and I asked him if he would ever play AD carry just randomly. And he said 'yeah I could see myself playing ADC.' We did have conversations about that. And at the end of the day you want to have the best possible team every year, so we agreed that this would only happen if an opportunity like this one arose. "When we realized that Caps was potentially an opportunity for us, we saw everyone was trying to get Caps, and at some point we went 'why don't we get Caps?' Which is like the most unexpected thing, we thought really outside the box here, and I think it will pay off, hopefully. I can't be happier actually about the actual team we have." ocelote noted that this is an extreme risk, going so far as to say the team will either finish in first or last place. "I guess you can call this a super team, and super teams have historically failed miserably, in a lot of different games. But is this team a super team because of the mechanical skill of the players? Or is it a super-team because the players are just good all-around players? That's a question I'd like to make to people." But while hopes are high for G2's LoL team, their CS:GO roster is in another place entirely. The team had an extremely poor showing in 2018, but ocelote said going forward, his personal expectations for the team are high. He and G2's management are fully calling the shots on the roster, something that, surprisingly, hasn't happened before. "For the first time, we have control over the team, with which French teams, has historically been impossible," he said. ocelote noted that some players, particularly those in the French scene, have developed relationships with each other over the years, and generally speaking, CS:GO players tend to take that into account when they form a roster. "Players are great at playing and understanding how to win, but players are not great at salvaging a situation when things are going downhill," he said. "Players are not always great. Because players are always emotionally attached and tunnel-visioned into the game, and they develop friendships with other players. I'm just explaining an example. What happens when you have a friendship with another player, your tunnel-vision to your job, you may not realize that this player is the problem. "And even if you realize that this player is a problem," he continued, "you don't have the pedigree to make a change there. There are players that can. But more often than not, you will find players make unreasonable decisions, or lack-thereof thanks to being too tunnel-visioned or having emotional attachment to other players." ocelote also pointed out that this means he can finally extend possible new signings past the limited French talent pool, which would be a first for some of the best players from the notoriously insular region. "I couldn't make an international team because I didn't have control of the team," he said. "But if I see an opportunity right now to make an international team, which means better access to talent by default while the players are mentally on board with it, why wouldn't we do that?"